The sun has got its hat on and is shining bright! On our journey to school we couldn't believe that all of the water and puddles on the road had disappeared. Where do you think all the water has gone? Despite all the rain yesterday, the work force kept busy on the s morning there were 30 posts in already. After that we had tea with the teachers and they were all delighted with the gifts we had brought to say thank you for having us. We also found out that this is Mr Mazimbo's last week of teaching as he is retiring next week. Mr Mazimbo Great Malvern Primary will miss you and we wish you a long and happy retirement. At break time time today we walked over to see the shops and food stalls where the children go to get their lunch at break time. Do you recognise any of these goodies? 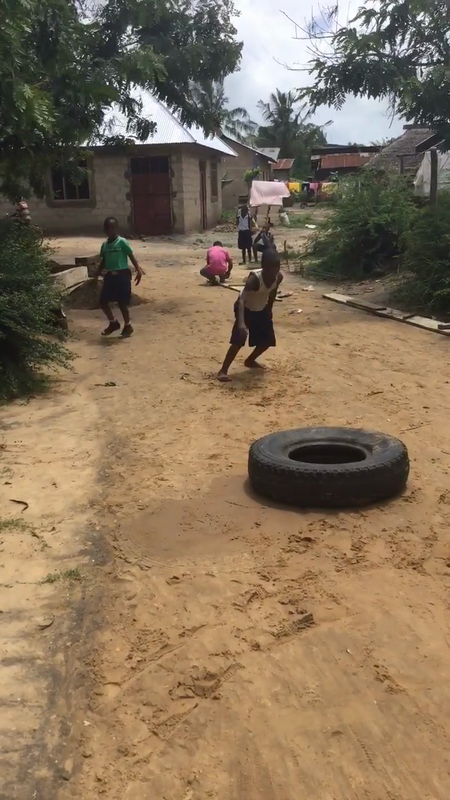 After the children had something to eat some of them found an old tyre and put on a wonderful display of gymnastics for us. We were all very impressed. Friday afternoon is sports afternoon and the children can choose to play cricket or football with their friends, or keep fit by skipping! The teachers allow the children to choose what they want to do and they organise themselves. Which game would you choose to play? Mr Kent couldn't resist a game of cricket. The children sang us goodbye and we handed out some sweeties and goodies to say goodbye and thank you. Back in the staff room we had presents for all the teachers and they gave us a beautiful picture to put up at school for you all to see and we all got some new flip flops! We were sad we to say goodbye to all of our special friends but will we see David very soon. I wonder what else would be on your teachers class shopping list? In Tanzanania the government have made a law that very stationery shop has to sell their goods for the same amount of money. I wonder if you know why this is? 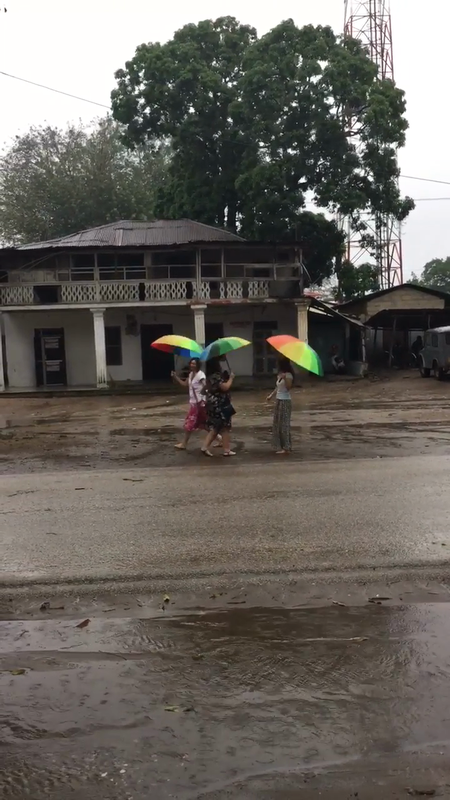 While we were waiting for David to pay, Mrs Cory, Mrs Eggleton and Mrs Russell from Somers Park, couldn't resist a little dance in the rain! We were able to take most of our shopping back to school and the rest we will pick up tomorrow. All of the things we have been able to buy will make such a difference to all of the children's learning. In Malvern there is a club called the Rotary club who have kindly helped us raise money to help fund our projects at Martin Shamba school. Today we went to meet a member of the Rotary club in Tanga called Raymond. He was very pleased to see us and will be getting in touch with the Malvern club. Well it is still raining and I wonder if you know what the children do at playtime when it is raining? What a busy Wednesday it has been! 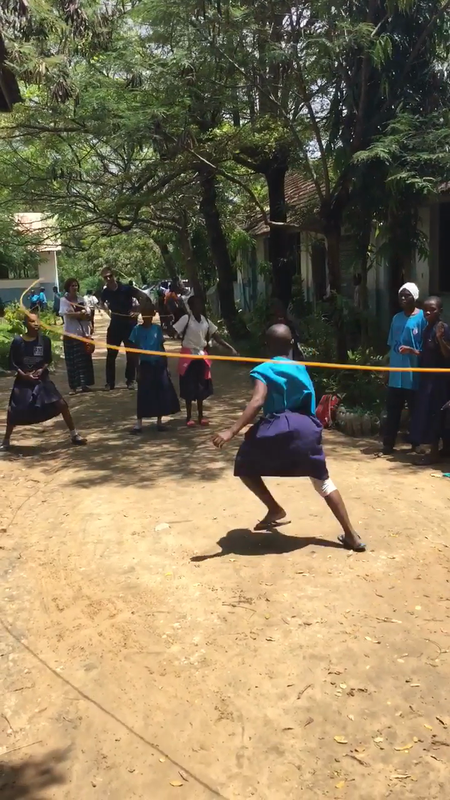 It was a very exciting day at school today as it was the Tanga tournament. 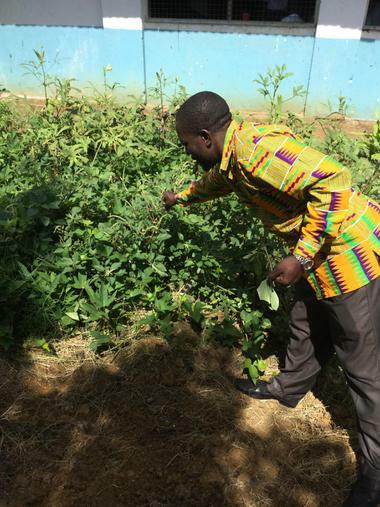 We were delighted when we got to Martin Shamba this morning to see that work on the fence had already begun. They were marking out the fence and digging some very big holes for the fence post! Exciting! Before we travelled off to a neighbouring school to watch the matches, Mrs Cory and Mrs Eggleton went into the Nursery class and Standard 1 to talk to the children about the importance of cleaning their teeth. The children all tried some toothpaste, the minty taste made them giggle! The children in standard 1did a little song and dance to say thank you. It was then off to Chumbageni school for the Cricket and Rugby tournament! The children were all quite relieved that the weather was a bit cooler today and we all hoped that the rain would hold off. It was tense afternoon but Martin Shamba did us proud and made it to the final! The children were amazing and managed to win the final by a 10-4 lead! Fantastic! It was an early start this morning and we were met with waves and smiles from all the children. Mr Hansen came and had a tour of the school and we all were amazed at how beautiful the garden was. Mr Kent couldn't believe how much the little plants he brought 6 years ago had grown! The children in the Nursery and Standard 1 were so excited to hear a story some of you might know- it's about 3 Billy Goats and a rather grumpy Troll. The children really enjoyed acting out the story and pretending to be the Troll. 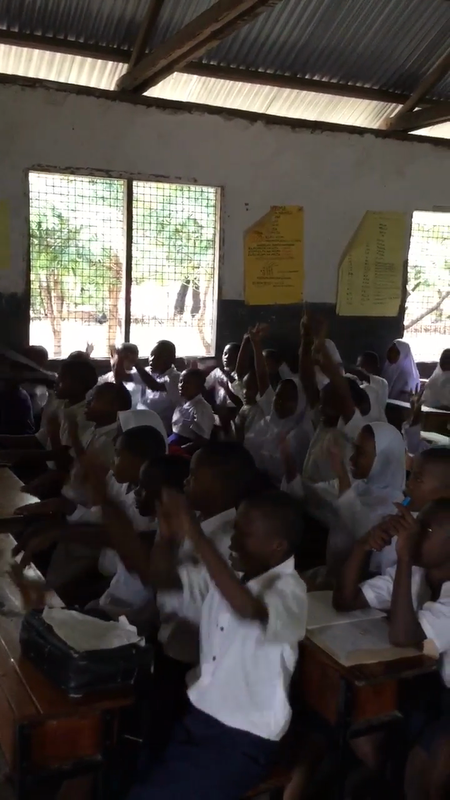 After lunch we we watched a Swahili lesson in Standard 5 with 108 children in the class! The teacher is new to the school and all of the children listened very carefully and joined in the lesson! Mr Kent and Mrs Eggleton couldn't imagine teaching that many children in one go! It was another wonderful day at Martin Shamba! Mrs Cory went over to Somers park school to do some cooking with the teachers there so who knows she might bring some recipes back for Great Malvern! Maths lessons looked great with the children all using things to help them count! Can you guess which story Mr Kent is telling Standard 1? Hello from a very sunny Tanzania! Well, what an amazing start to our trip to see our wonderful friends in Martin Shamba. 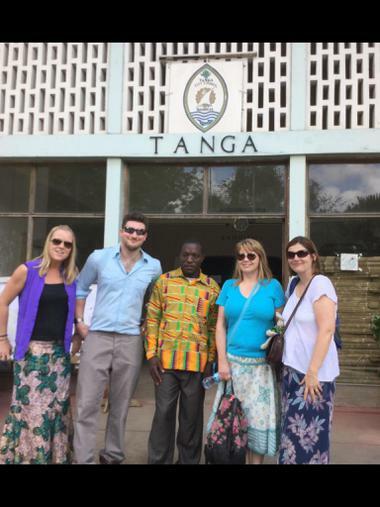 We were met by David this morning and taken to the Education Office where we were warmly welcomed to Tanga. We all had to write our name in the visitors book and felt very important. Next we set off to the school and all enjoyed the wonderful sights and sounds along the way- including three donkeys pulling a vey large cart. Once at school we were met with lots of hugs and greetings and Mr Kent couldn't believe all of the changes since the last time he visited 6 years ago. We saw lots of things around the school that reminded us of all of you back home. The teachers had a made a lovely banner to welcome us and even laid on tea and biscuits. After that that the children put on the most wonderful display of singing and dancing and even managed to persuade Mrs Cory and Mrs Eggleton to join in- not that they needed much encouragement!! We then went to see Standard 4 and they were doing a science lesson all about circuits. There were over 100 children in the class! Just imagine how much marking the teacher had to do! We have been practising our Swahili but I think we may need a few more lessons yet! Jambo! What a day! First we were taken to meet the Education Officer. We were warmly welcomed and then he explained to us that on Sunday 25th October there is an election to decide who will be the next Tanzanian president. 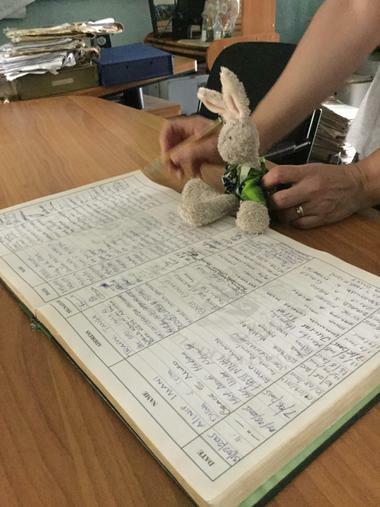 We introduced ourselves and signed the visitors book. Stanley Rabbit joined in too. We arrived at Martinshamba and were greeted by all of the children and teachers. It was lovely to see everyone again and we were given lots of hugs. Afterwards we were given a tour of the school. it is amazing how much it has changed! The garden now has a lot of vegetables growing. Okra, Tembele, Mchi cha, Tomatoe, Pumpkin and Kunde. David the headteacher has prepared two bed for us to plant more tomorrow. Titus, who was head boy last year, arrived to say hello. He starts Secondary School in December. His exam results were so good that he has been accepted into the best school in Tanga. He was so happy when we showed him a video from Charlie Glover. Charlie has donated his football boots and we will take them to school tomorrow to give to him. He was smiling ear to ear! The dancing, singing and gymnastic performance was spectacular as always! we were impressed to see that this year they even had a younger boys group perform. Maybe we need to start a boys dance group? It was very cool and included breakdancing moves and some impressive movement of the hips. I haven't found out what 'they are' is. Can you find out? 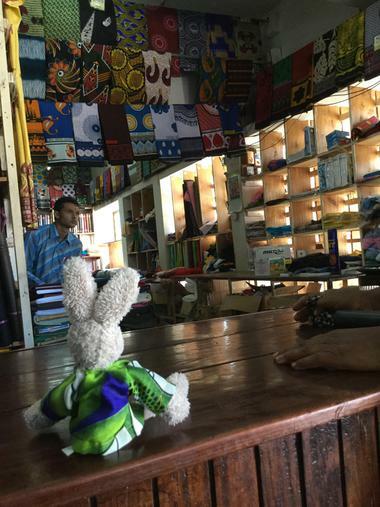 We then went shopping for material and were measured up. We found Mr Jackson-Reads measurements from last year and are bringing him a shirt home as a surprise. We hope we can Skype you all tomorrow. Today we went to assembly – not at 1.15pm like our assembly but at 7.30am! At Martinshamba the assembly takes place outside and is led by one of the senior pupils in Standard 6. 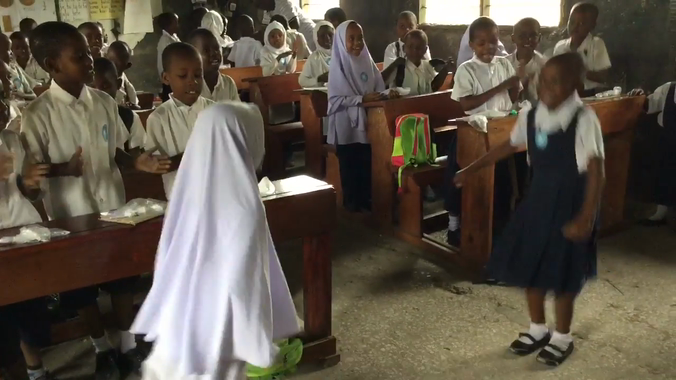 They do exercises and then sing the Tanzanian National Anthem and the African Nation Anthem. They have their uniform checked to make sure it is clean, and they have to have clean hands and short hair. We will try and upload the video so you can see. Then we took the shoes to the Nursery class who were so excited to have shoes and socks and showed all their friends. We went to a very smart shop to buy seeds for the garden, and were really surprised to see that lots of them were sold in tins like baked bean tins rather than packets. We returned to school to see that the fence around the garden is well on the way to being finished already and looks very good. Mrs Smout went to Standard 4 to teach them “1,2,3,4,5 a day” and we finished the lesson with having fun with bubbles, which the children really enjoyed. 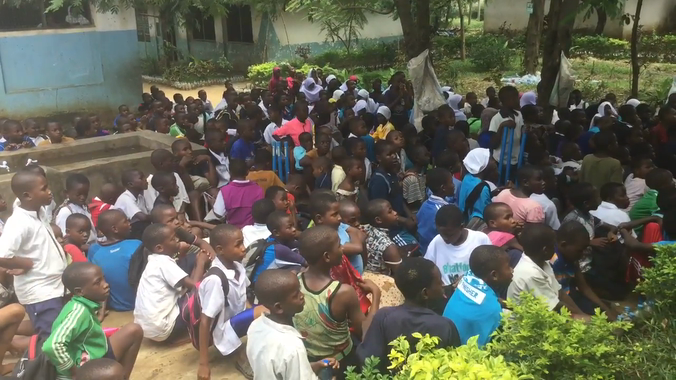 We were delighted to see that Mr Mazimbo (the deputy headteacher and keen sports teacher) was taking a group of children to play “Kwik Cricket” with the set we gave them last year for the second time this week – the children are getting very good at it. 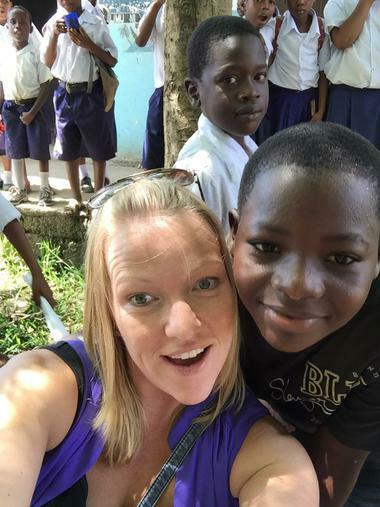 We enjoyed a lovely “teatime” (hard boiled eggs, samosas, bread and jam, Fanta and tea) with all the teachers and we talked about how happy we have been being in Martinshamba this week, and how welcome everyone has made us feel. They said how much they have enjoyed having us here and how we have all learned from each other this week. We are excited to share all we have experienced and done when we return to Great Malvern. All the children sadly waved us on our way; the headteacher had organised “Bajajees” (small motorcycle taxis – see photos) to take us on our final journey away from Martinshamba. 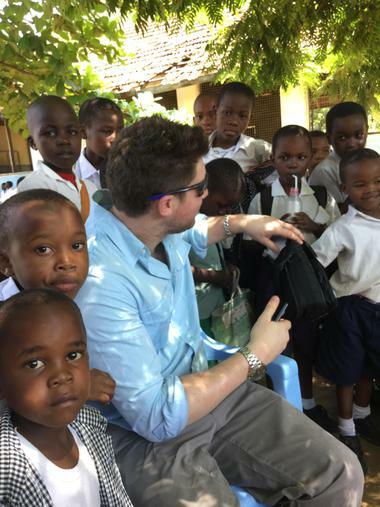 We have had an incredible week in Tanzania! That should read Day 4 but it won't change the text! Today’s highlight was the Tanga Tournament! Martinshamba had high hope of beating their rivals Chumbageni, and the team set off with the headteacher, David at 9.30am. We arrived for the final, only to find out that both Martinshamba and Chumbageni had got through and were neck and neck at 2-2! We shouted loudly for our team who were playing in the scorching heat. Even after extra time no further goals had been scored so , for the first time in the tournament history, it went to penalties. Chumbageni just won, by 1 goal. Both teams were very proud of themselves and much singing and dancing and drums ensued. The winning team and the runners up were presented with medals by Mrs Smout and Miss Henderson which they were delighted with. Back at Martinshamba in the morning we were going to take the Nursery class out to a quieter classroom, but they had remembered the story that they had had under the tree yesterday, and they ran straight to sit down ready for a story. Mrs Dudman read The Enormous Turnip, but when she took the turnip out of the bag it had been nibbled! She made Mrs Smout empty the bag in case whatever had eaten it was still in there! 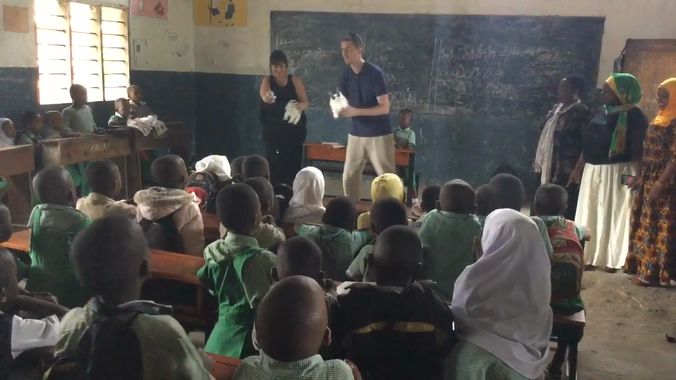 As we read to the children, and taught them “Heads Shoulders Knees and Toes” (which we now know in Swahili – watch out Great Malvern, we’re going to teach it to you!) we noticed that most of the children had no shoes. When we asked the staff they explained that parents often wait until the children are in full time school before they buy shoes. Because we know how hot and stony the ground is we thought we could use the money generously donated by our parents at the Harvest Festival to provide shoes for these children. We measured their feet and visited the local market to buy 18 pairs of shoes. We will share our photos tomorrow! Today has been very busy – Mrs Smout went and taught Standard 3 and 4 the Bean Harvest Song, and told the story of the Scarecrow and we handed out even more loom bands! Mrs Dudman and Mr Jackson Read took the Nursery class outside and sat under a tree in the baking sun to tell the story of The Gingerbread Man, helped out by Titus! The children loved Mr Read being the fox with his puppet, and laughed lots when the gingerbread man got eaten! They then all enjoyed munching on gingerbread men themselves. Our world map on the wall is nearly complete, and the children worked really hard painting stones with pictures of the crops they grow at the school to label the garden – just like we did with Eco club in Great Malvern. The stones have the names of the crops in Swahili and English. We visited lots of classes today, Mr Read told The Enormous Turnip story to Standard 4 who all looked at the turnip and shouted “What is it?” They loved acting out the story. We have swapped two of our footballs for the amazing Tanzanian footballs made out of woven elastic and material. 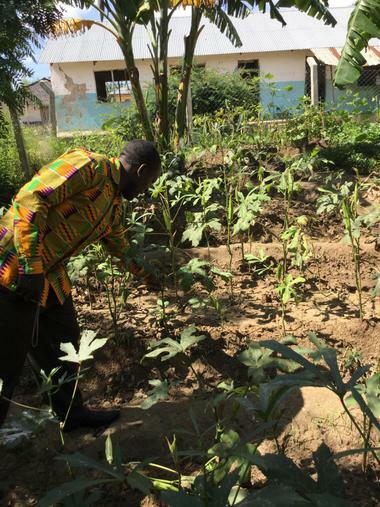 Miss Henderson has been working the new headteacher and the gardening club to continue to develop the garden – you can see on our photos Titus pointing out some of the crops. We are working on developing a fence to keep out the goats who eat all the crops! For lunch the children had cooked potato and kasava from the garden, it was delicious! We will add more photos tomorrow - the internet connection is very slow and it is taking us about 10 minutes to load one on! Another incredible day in Tanzania for all of us today - we have seen so much and done so many things! The day started early as we packed up all the things we were taking to the school - the loom bands, the footballs, our gorgeous story sacks (thank you Mrs Cunningham and MrsBrimmell! ), all the pencil cases for the teachers - so much to take that we carried 4 suitcases into school! Once again it was a very warm welcome from all the teachers and pupils. They were especially excited today as they knew we were going to be going into the classes to teach. Mrs Smout and Mrs Dudman went to Standard 2 and read the Scarecrow story, and taught the children Bean Harvest song which they loved, especially 'French Bean - ooo la la'! The children loved seeing Sunny Bunny and his book, and learning all about our school from the photos. Mr Jackson Read went into Standard 5 and 6 and handed out the letters to the children, and they began to write their replies. They will be ready tomorrow. Miss Henderson went into Standard 1 and read her favourite "Enormous Turnip" story to the class. They joined in with the actions and taught Miss Henderson the Swahili words for the characters in the story. This was our first day in Martinshamba Primary School. We started the day visiting all the important people who are in charge of education in Tanga. We even met the mayor and Sunny Bunny, Marvellous Mouse and Stanley Rabbit had their photo taken with him too! Then we went to the school, following the headteacher, David who was wearing a gold shirt and riding a motorbike! Very cool! When we got to school we were so excited and the children were REALLY excited to see us! We met Titus, the head boy and lots of the children practised their English when they saw us. 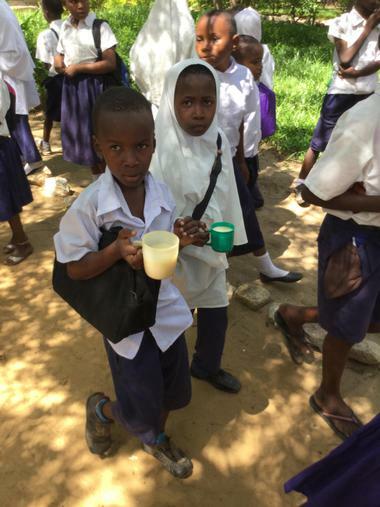 When we arrived they were all having Uji for their snack and walked all round the school to see how the projects were progressing. The water tank looks amazing and the children are so pleased to have water in school. They use it to drink, cook, clean and water the garden. The garden is growing all the time but the goats keep munching the crops! We are going to buy a fence to stop this from happening. We are going to buy seeds and plants to make the garden even more amazing, using the money raised by Mrs Brimmell's Fresh Start group and the generous donation from Mrs Cunningham. It was our last day in school today and again we were warmly welcomed by all the children and teachers. We visited Standard 4, 5 and 6 to deliver the letters from 4C, 5/6 He and 5/6 B. The children's faces lit up as we handed them a letter and a pencil. Mr Fair captured this with lots of photos that we will share with you when we get home. They especially liked it when we told them how to say your names. Mrs Selby practiced her Swahili and has learnt to write some phrases with help from Titus, the head boy. We are bringing the replies back for you to enjoy. We also handed out the holiday diaries from Ryan, Ted, Charlie, Megan and James to some of the older children who were fascinated by the sights and photos. They couldn't believe that you would let them keep something so good and as they walked home they had them close to their chests to keep them safe! We had a wonderful afternoon as the girls from Standard 6 and some of the teachers lit three fires in one of the classrooms and cooked traditional Tanzanian food. We helped with the preparation and cooking and Mrs Hanson especially liked the little wooden fold out seat with a coconut spike at the end that they use to get the flesh grated from the inside of a coconut. The children laughed at the English names for the vegetables and liked it that many were similar in Swahili. The food was amazing and we had banana and coconut curry, a pea, ginger and tomato dish and spinach. They were also surprised that boys cooked in the UK as in Tanzania it is only girls! 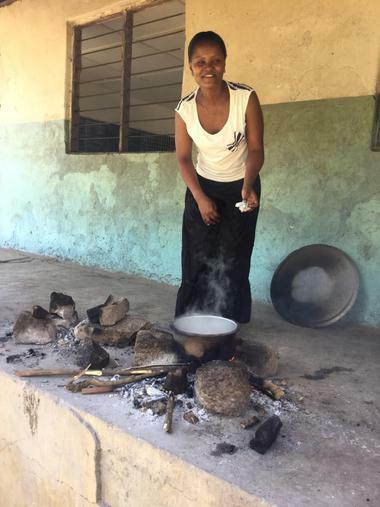 Would you like to try some Tanzanian cooking back at school? When we left Martinshamba school many of the children ran after the car waving their new pencils and saying "kwaheri". In the evening we were all invited to a special dinner with the education officers and members of the Tanzanian government! They thanked all the schools from Malvern that have linked with Tanga and told us that it was helping them such a lot, and they were keen to learn more about schools and British culture. We all agreed that it is so important that we learn more about the world that we share. We all wore our new Tanzanian outfits and looked the part! We woke up this morning to the most incredible torrential rain. It fell in huge sheets and was so warm! When we arrived at school it was still raining and there were streams of water running through the grounds. It was over as quickly as it had begun and was roasting hot again before long. All four of us spent the morning teaching the story "Oliver's vegetables". We learnt that many vegetable names are very similar in Swahili; carrots are karoti, spinach is sipinachi and cabbage is kabugi! The children loved the puppets and story and then got to use paints to make the vegetables from the story. 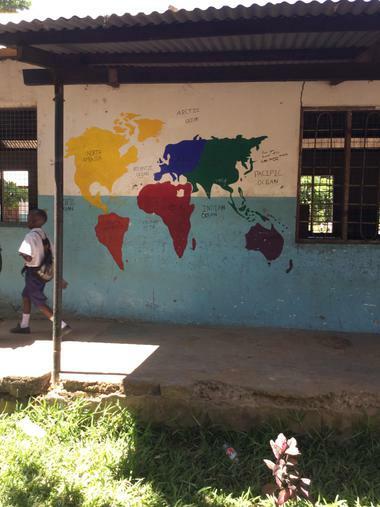 This is a real treat as they don't use paints in Tanzanian schools as they don't have them! The children were incredibly careful and some of them used razor blades to cut them out. Some of them asked to paint houses, cars and people too. After tea the children took us to see their sports area. Before long we had about a hundred children following us and parents and little ones coming out of their houses to see what was going on. They proudly showed us the goal posts and sand and grass area and there was even a plastic bag football. Do you remember making those last year in school? We had dinner at Agnes, the Head teacher's house and met her family. We taught them how to play dominoes which was great fun and left them a set. 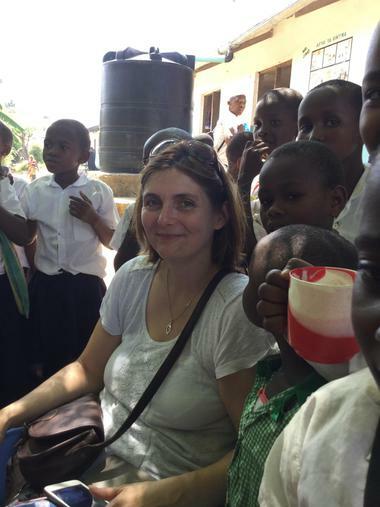 Mrs Selby really loves the banana curry that they eat in Tanzania! We are learning some Tanzanian cooking tomorrow so maybe will be able to make it for you to try! Kwaheri everyone and have a great half term! We were greeted at Martinshamba by hundreds of little children all shouting "Hoora-hoora" which is a Swahili cheer! It was amazing. This morning was a gardening morning. The older children were using the tools that gardening club sent last year to get some new soil ready and after a lot of digging and hoeing the beds were ready. They were really pleased with the seeds that gardening club sent over and planted radishes, cabbage and lettuce in the new beds. Lots of little children who are too small for school came out of their homes to watch what we were doing and some of them were frightened of our white skin and fair hair as they had never seen a white person before. After gardening we had tea. In the UK we have tea in the evening but in Tanzania they have tea at 10 o clock in the morning! It sounds early but as it's so hot they have assembly at 7.45 a.m. so by 10 they are ready for a break. The tap is unlocked for the children to have a drink but they have no snack or fruit, just a drink of water. After tea we went to Chembegeni School for the football tournament. Mr Fair was brilliant and organised 6 matches between the local schools. It was really hot by then and everyone was dripping in sweat and had to rest under the trees between the games. Martinshamba got 3rd place and were thrilled with their medals and certificates. Tanzanian children don't usually get prizes and there was a huge gasp from all the children when they saw them. It was lovely! The team players were desperate to take them home to show their families. The water project is coming along really well. We saw the type of tank we have ordered at Chembegeni and we hope it will be delivered tomorrow. The base is now finished and some of the older boys in Standard 6 helped to build it. 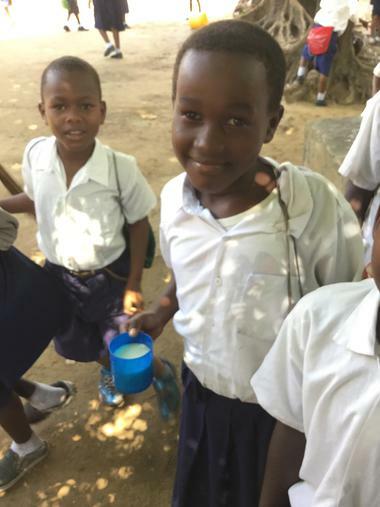 Tomorrow we are painting with standards 2 and 3 which could be interesting as Tanzanian children very rarely paint and most of them will never have used paint! We will tell you about it tomorrow. This morning we arrived at school to find the children already working on the Water Project by digging out the trenches for the bricks to be put into. Mrs Selby was filming the children when a small snake came out of a hole!!!!! Next we visited nursery class with 22 children aged 5 to 7. First we taught the children how to sing Big Red Combine Harvester and do the actions. Mrs Dudman kindly let us borrow her enormous turnip story box. We told the story and used the props to act it out. The children taught us the Swahili names of the characters in the story. Mrs Hanson and Mrs Selby then went to read the same story to the Standard 1 and 2 children and the Martinshamba teachers joined as well. Mr Fair and Miss Henderson taught cricket to the older children with about 200 children watching. Mr Fair demonstrated how to hit the ball which they were very impressed by. Cocoa and Stanley then had a tour of the school and shared their books with the teachers. They love looking of pictures of all the exciting things that you do in Great Malvern and they were really interested in the garden and the waterbutt to collect water. After school we visited Mrs Sidiki’s house. Do you remember when she visited in June? We had beef stew, chips and vegetables with coconut sauce. We are going to learn how to cook this on Thursday at the school as we all really like this. Maybe we could add it to the lunch time menu! Finally we came back to the hotel in a Dala dala. Remember the bus Miss Henderson showed you in assembly? It was very full and Mr Fair was very squashed! We went to visit the chief of education at his offices this morning. We signed his visitors book and he told us how happy he is to have this link and what a difference it makes to the schools in the city. After that we travelled to Martinshamba school where we were warmly welcomed by all the staff and the children. As you can see by the photos they put on a magnificent performance which included singing, dancing and awesome gymnastics. The singing was so powerful that we were nearly in tears, especially when they sang the Tanzanian national anthem. Do you remember when the teachers did this in assembly when they visited in June? We watched 2 maths lessons and a geography lesson about the water cycle using the display created by year 5/6He last year. 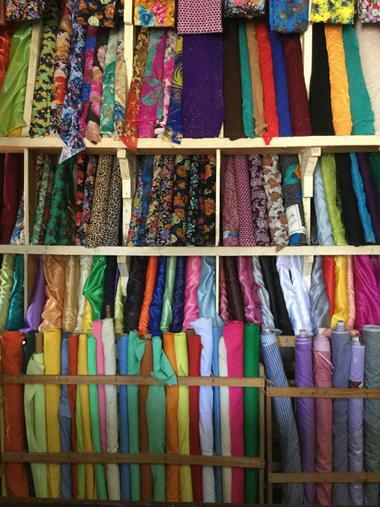 After school we went shopping for material to make outfits for us show you on our return. We are really looking forward to what they have planned for us tomorrow. 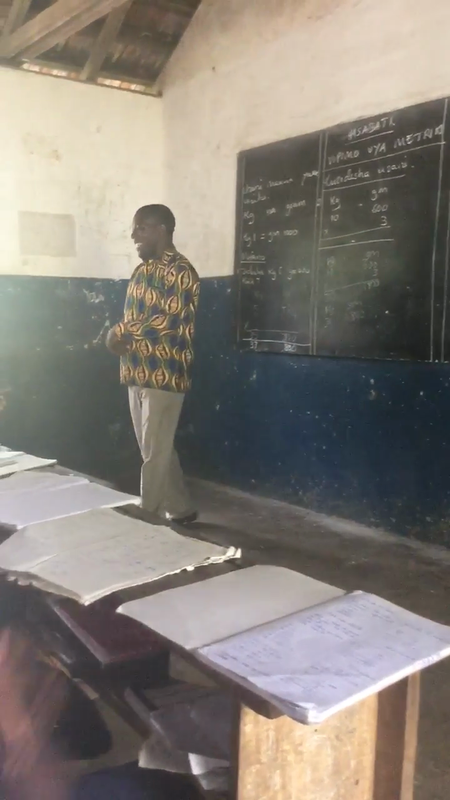 We have recently heard from the headteacher at Martinshamba, Mrs Agnes Mbwela, who has been updating us on how some of the projects we set up are progressing. She is pleased to tell us that they have set up their own Gardening Club, just like the one at Great Malvern and have purchased lots of new seeds from the money they have made by selling them to the local community. The entire school are in preparation for their yearly exams but they have still found time to send the newly 'kitted-out' football team to play matches against local schools, Chuda, Mbawa and Chumbageni. They are also in the process of setting up a Water Conservation Project which will run alongside themes children will be learning about at Great Malvern in the Spring Term. Keep scrolling down to see the new photographs from Tanga! 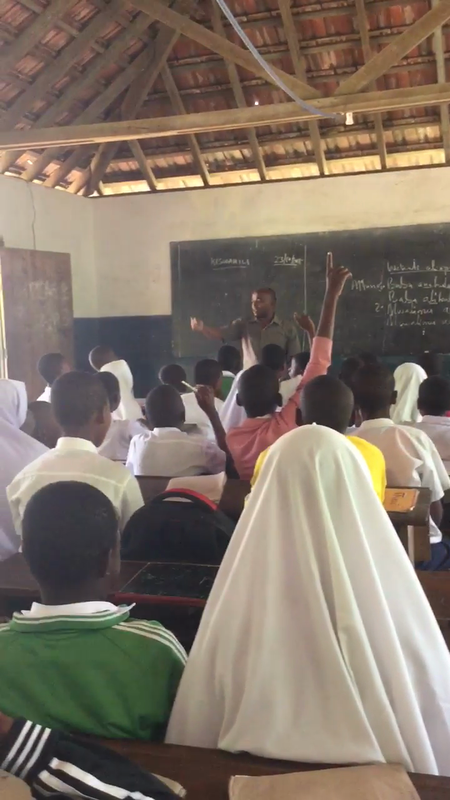 We cannot believe we have completed our final day in Tanga! Mr Kent and Mr Bothma have been reading to the children at Martinshamba, including sharing the super book from 2L. Miss Henderson's Swahili has continued to impress too! We have been treated to a wonderful farewell dance from the staff and children, and have been saying a fond farewell in return. It has been an amazing experience and we hope to hear regularly from Martinshamba when we return home. If you or your Mums and Dads have questions you would like us to answer about our trip during assembly when we return then please post them on the Guestbook section of the Website, all you need is an email address. Alternatively, write some down and hand them to us when we get back. We hope you have enjoyed our updates and photographs and we are really looking forward to seeing you all and sharing our experiences when we return to Great Malvern. We have taken part in a very exciting day today which included a visit to buy ten Orange trees & ten Mango trees for the children at Martinshamba to plant, with the money kindly donated by Great Malvern's Gardening Club which is led by Mrs Kay and Mrs Gove. We hope that the children at Martinshamba will enjoy the fruits they produce in the years to come. We also have been trading the money donated by Mrs Cunningham for lots of beautiful flowers which will also be planted in the school grounds. After this we visited Chumbagani, which is linked with Somers Park, for a football match which Martinshamba won 1-0, much to the delight of Mr Bothma & Mr Kent! Please check the blog later as we will hopefully be able to share with you photographs from today. We have just returned from a very busy day at Martinshamba Primary School where Mr Bothma & Miss Henderson have been teaching songs to Standard 4 as well as sharing the super songs from our own Year 3/4 classes. Mr Kent has been spending time with the lovely nursery children and Cocoa has been as busy as ever! Standards 5&6 have been working hard, writing their replies to the letters we have passed on from our classes. We have also visited Mabawa, whose children and staff have been very welcoming. Some children have been responding to the books from 1C & 2T and Martinshamba's head girl, Sabrina, has also been busy replying to a letter from our School Council. We have also planted some new trees on the school grounds and handed out many more football shirts to the children (look out for yours! ), they were delighted with them and we wish to pass on a huge thank you to those of you who donated them. At this moment we look forward to shortly being guests for dinner at the headteacher's home. 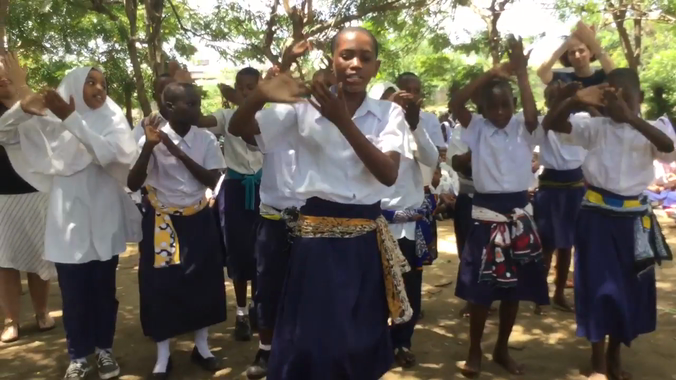 We hope you are enjoying reading our blog and learning lots about Tanzanian life. We are about to set off for our third day at Martinshamba. We completed our day yesterday by presenting the school football team with their shirts, in which they all looked very smart. We then watched the team use their new football from Malvern in a football game and it was amazing to see the children run so enthusiastically in the very hot weather. We were invited to Mr & Mrs Mshana's home for last evening's meal, Mrs Mshana is a teacher at the school and the meal was delicious. Afterwards, their children were very pleased with their Liverpool and Manchester United shirts we passed on as gifts. We will hopefully update you later on today. Habari? We are currently back at Martinshamba School taking part in Math's and English lessons. There are around 50 children in each class and we have been swapping old pencils for new. We have given the football team their new shirts and are looking forward to seeing the children play in them at a match on Thursday. We have shared the beautiful book created by Mrs Collins' class and the children at Martinshamba have loved reading it! We have also seen Cocoa from 1C taking part in lots of activities, he is really enjoying himself! The temperature is around 30 degrees Celsius most of the time so the children don't appear to run around as much as all of you back home! The children at Martinshamba have been doing some cooking too, using charcoal and a steel drum, certainly no microwaves! It is 'tea-time' for all the teachers now so we do have to go! We are looking forward to updating you all soon. We have just enjoyed our first amazing day at Martinshamba Primary School. We have met all of the children and were treated to a spectacular show including singing, gymnastics, and phenomenal African Dance! We arrived safely in Tanga yesterday after a long journey, 21 hours after leaving Malvern. We flew through the night and the other passengers discovered Mr Kent is equally as loud on an aeroplane as he is in the classroom! After many adventures trying to set up an Internet connection we hope will be able to speak to many of you very soon! Miss Henderson is catching up with old friends and Mr Bothma's Swahili is gradually improving! We will hopefully update our blog with some photographs soon! 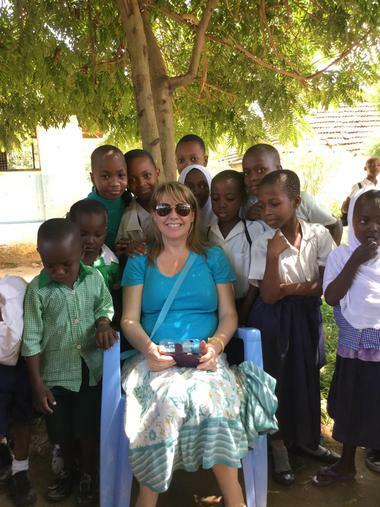 Miss Henderson, Mr Bothma & Mr Kent are visiting our link school in Tanzania very soon. We will also be regularly blogging to keep you all updated with life at, and our visit to Martinshamba School. Classes are currently working hard on projects to share with the pupils at our link school during our visit and beyond. We’re also collecting any football shirts you might have at home to take with us. 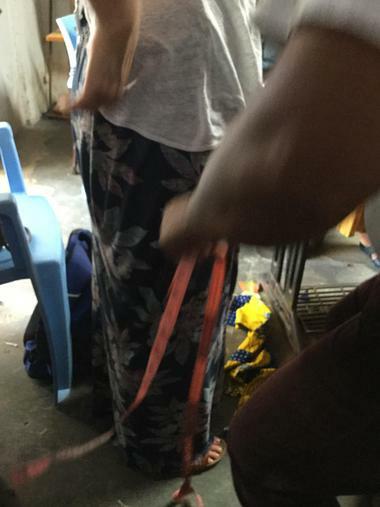 If you have any shirts that are now too small, please continue to send them in. The response so far has been amazing, thanks! The crowds celebrated when we scored! The Martinshamba team played brilliantly. The girls played a cricket tournament. 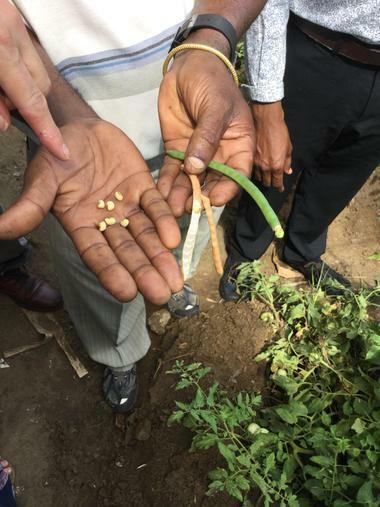 Mrs Mbelwa handed out the seeds for planting. The base for the water tank. The children liked the new footballs. Cocoa watching the water project get started. 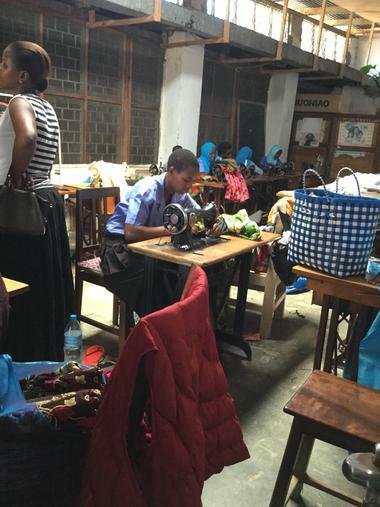 This is Amina the head girl at Martinshamba. We showed the children Cocoa and Stanley's books. Mr Fair is teaching how to play cricket. Mr Fair got too hot and had to sit down! We gave the nursery children hairbands and cars. We taught the children "Big red combine harvester"
The first class loved our songs and stories. Mr Michael is one of the teachers.